Christmas shopping for your dad can sometimes seem like a daunting task. After all, dads can be fussy individuals. While it may be tempting to cut your losses and buy them a gift voucher, you’ll feel better if you actually take the time to put some thought into their present. Then there’s the sock issue. Sure, socks are a great gift. They’re safe and reliable. Not to mention useful. But come on, how many pairs of feet does your dad have? Don’t despair! The truth is there are very few dads nowadays who don’t own at least one electronic device though they may try to convince you otherwise. With this in mind, we’ve come up with a list of 5 great tech-savvy Xmas gifts, perfect for even the pickiest of dads. Has your dad just bought a new iPhone 6? Well then, the last thing he’d want would be for it to get damaged, or worse, bent. With this composite case from Urban Armor, that certainly won’t happen. This case has a hard outer shell to protect against scratches and a soft inner core to ensure a snug fit for your phone. It also comes with a free HD screen guard for even more added protection. This small, portable device attaches to the vent in your car allowing you to dial and receive hands free phone calls in a safe and secure way. The new design has been recently expanded to accommodate smartphones of up to six inches, perfect for dads on the go! Designed by Jivo in collaboration with extreme adventurer Bear Grylls, this water proof, shock resistant backpack can accommodate Macbooks of up to 15 inches. It also comes with an adjustable shoulder strap, as well as a padded pocket for extra protection. It’s the ideal place for your dad to store his Ipad, MacBook or tablet. Is your dad a music fanatic? If so, then he will love these Black Reference R6i headphones from Kilspch. Made from a combination of constructed aluminum and elastomer, this sleek design is lightweight, durable and comfortable. Klipsch have also used the same advanced acoustic engineering and industrial design from their legendary Reference home theatre speakers to provide high premium performance, voice and design for the Klipsch Reference R6i monitors. Does your dad struggle to get up for work in the morning? 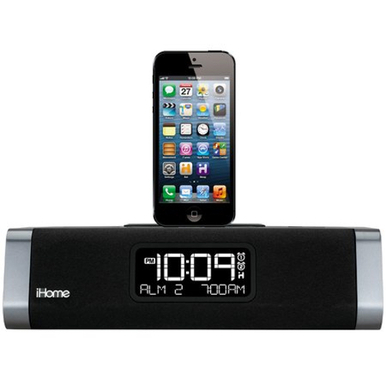 If the answer is yes then the iDL45 desktop clock radio from iHome would be a great gift for him. The iDL45 is a dual alarm clock radio for iPad, iPhone and iPod that allows you to listen to your favourite music while simultaneously charging your iPad, iPhone or iPod. You can also choose whether you want to wake up to the radio, or your very own custom playlist. All of these fantastic gifts and lots more are available on our website now. Give your dad a treat this Christmas!